CORAL recovering from mass bleaching events in the Far North are "genetic gold" for the Great Barrier Reef. The Reef and Rainforest Research Centre yesterday announced there was healthy, colourful coral at key reef tourism hot spots across the region, in locations that had suffered during back-to-back bleaching events in 2016 and 2017. The Cairns based agency, in co-operation with the Association of Marine Park Tourism Operators, conducted surveys of bleaching levels at several key dive sites such as Saxon, Norman and Moore reefs, which it claims now show strong signs of recovery. RRRC managing director Sheriden Morris said multiple recent reports and images from marine tourism operators and their clients showed some sites had been recovering well. "Saxon Reef, for example, suffered some form of bleaching on 47.1 per cent of its live coral cover during the 2016 event," she said. "Fortunately, much of the bleached coral recovered thanks to better conditions experienced in 2018. "However, this recovery is always going to be contingent on environmental conditions. "It is critical that all efforts are made to promote the health and resilience of the Great Barrier Reef." About 50 per cent of shallow water corals on the Reef died during the mass bleaching events, according to the Great Barrier Reef Marine Park Authority. The authority's chief scientist Dr David Wachenfeld said local signs of reef recovery in the region was encouraging. "These corals showing new growth are genetic gold, and important to regenerating the next generation of corals," he said. "That's why it's important we do all we can to protect these corals through Crown-of-Thorns starfish control, local actions to improve resilience, and addressing climate change at the global level." 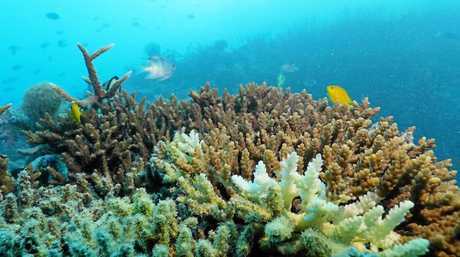 He said it was important, however, to remember that coral reefs globally continued to be under threat from climate change caused by rising greenhouse gas emissions. Quicksilver Group environmental compliance manager Doug Baird said all of the company's dive sites that survived mass bleaching events had shown strong signs of recovery. "They look great now," he said. "We were fortunate that the effects of bleaching were very patchy."